In keeping with the theme of “Giving Tuesday,” all you need to do to enter this giveaway is leave a comment telling me to whom you would give one or more of the books, if you win. Maybe you already have all three titles and want to give them to various friends or family members to help them on their vegan journey. (they make great holiday gifts!) Or maybe you want to keep one or two of the titles you don’t yet give and give away the others to someone you know, or maybe to the local library. Then again, maybe you don’t have any of these books yet, and want to keep them all for yourself so you can have more ways to cook vegan food for yourself and your family. That’s okay too! Enter now: Simply leave a comment telling me what you would do if you won these three cookbooks. For additional chances to enter (and to help spread the word) simply link to this giveaway on Facebook, Twitter, or your blog, and leave additional comments saying what you did. The giveaway closes on Sunday night at midnight. A winner will be announced on Monday, December 3. Good Luck! If I won these three cookbooks, I would give Vegan on the Cheap (which I already own and love) to my friend Catherine, who is a vegetarian, but cooking challenged. I would keep the other two, which I don’t have, and use them every day, like I do Vegan on the Cheap and Quick Fix Vegan and Vegan Fire and Spice. Yours are the most used cookbooks in my collection these days! One of my friends borrowed my copy of Vegan on the Cheap and almost never gave it back! So if I won, I would give her this new copy! I’d scour them for quick recipes my kids (and wife) will eat that we can make after school and work. And of course they would expand my Robin Robertson section on my bookshelf, which already has at least 5 books! I would keep Vegan on the Cheap all to myself, give Party Vegan to my favorite party-planning cousin, and 1000 Vegan recipes to a friend who struggles to cook for his daughter’s vegan friend. I would give 1,000 Vegan Recipes (which I already own a copy of) to my co-worker who is considering becoming vegan. I would give my friend the Party Vegan and keep the other two. Party Vegan would go to my uncle, who loves entertaining and cooking more than anything, and 1000 Vegan Recipes would go to my brother and his wife to encourage them to try more vegan recipes, especially with their little veggie-loving toddler. Vegan on the Cheap will stay here for my sister and me to share. Cheers! Well our group, Santa Clara County Activists for Animals, is having our 3rd Annuall Vegan Holiday Bake Sale to benefit 3 different animal groups, which includes our local wildlife center here and a cat rescue. The majority of the donations will go to our groups outreach to the community, whereby we present talks and films exploring animal cruelty issues, especially animals used for food. We would like to have these books because we want to use them as rewards for some of our bakers, for their baked goods, (best presentation, etc), but also to some of the other volunteers who are putting in long hours to make this happen in preparation and graphics, etc. every year. What a great reward one of your books would be! I will gladly post on my facebook! I would cook, cook, and cook lots of fabulous Vegan recipes!! I would give Vegan on the Cheap to my co-worker who recently told me that he and his wife had given up being vegan because they found it too expensive. I’m new to vegan and am looking for ideas for new favorites. I would give one to my daughter and keep the others!! I have enjoyed several recipes out of your books. Thank you! I would love to have these in my kitchen so I wouldn’t have to keep borrowing them from the library! and the party one to a new acquaintance of mine who is interested in veganism, and likes dinner parties. If I won these 3 books, I would jump up and down and do a happy dance. I would also cook great food for my friends who love to try new stuff! Thanks for the chance to win! I’d give 1000 Vegan Recipes to my mom because I already have it and love it and she does so much for me, she deserves an awesome cookbook surprise! Boy oh boy!!! I would be THRILLED to gift them to my beautiful new daughter-in-law, my handsome son and their super cute little 6 month old son. What better investment for a happy, healthy family future!! 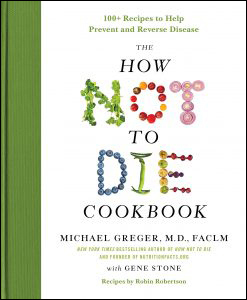 I need this book to expand my repertoire and possibly get my husband to try my plant based dishes. I would use the 1000 Vegan Recipes to replace the one my dog enjoyed eating! ( I probably couldn’t really get rid of the original book) I would offer Vegan on the Cheap and Party Vegan to Pigs Peace Sanctuary for their silent auction in the summer. I think you’ve met Judy but you can catch up with her and with all the animals at pigspeace.org Thank you for your wonderful books! I would give the Party one to one of my best friends who does a ton of hosting – and she’s vegan. She collects vegan appetizer books! The other two I would keep for myself. 🙂 I really, really want to get a copy of 1,000 Vegan Recipes! I would give them top my 19 year old niece wh0 I am trying to convince a plant based diet would make her a little bit smarter and stronger. She says there are no good recipes for vegetarians and these would show her otherwise. Holy Tofu Nuggets – 3 book giveaway??!! I would give the 1,000 Vegan Recipes to my parents who are recent veg converts (only took me 8 years!) and keep the other two because I love to entertain and am recently on a tighter budget than usual. Thanks, Robin! Well, honestly, I would keep them. I don’t know any other vegetarians, so I am the only one who would be interested in them! I keep trying to get my husband to eat more vegetables, so I would put these books to good use. I would definitely give a book (or two or three) to my mom and step-dad. They like to eat vegan semi-regularly and I’m sure a great cookbook would encourage them to do it more often! I love your cookbooks! I would definitely give Vegan on the Cheap to my dear daughter, a vegan who struggles to make ends meet. 1,000 Vegan Recipes goes to my wonderful, longtime friends, Bruce and Martie, who recently became vegan and love to entertain. I would keep Party Vegan for myself since sharing delicious vegan food in a party environment is a terrific way to enlighten and transform people into adopting new foods for celebrating life. I’d give the ‘1000 Vegan Recipes’ book to my dad, who is currently learning to make healthier decisions in his everyday meal planning. I would give 1,000 Vegan Recipes to my parents, Vegan on the Cheap to my broke little brother, and I’d probably give Party Vegan to my friend who likes to have people over a lot. Well first I would have to flip through them all 🙂 But then I would gift the 1000 recipes to a dear vegan friend. I’d gift the cheap to my vegan husband, and might have to hold on to the party one and throw a couple of get togethers so everyone can enjoy it! I would donate Vegan on the Cheap (which I own) to the library so everybody can benefit from it! Start cooking from the other 2! I would share them with a friend that is new to veganism and it has healed her body and she is sticking to it and cannot afford to buy it all on her own. What would I do? I’d probably geek out with joy first, then I’d be scouring them for recipes and ideas to add to my everyday menu and menus for entertaining. I would cook/bake up a storm. Share the food with others and share the cookbooks. Can’t keep all the awesomenes to oneself. I’d cook, cook, cook, and make a certain clueless (uninformed, actually) friend eat them, along w/ her words. When i received them I’d scan them for some standout recipes, and make up some menus for three activities. #1 on my weekly family menu, I’d add at least one RR recipe. This would happen each week. #2 as I live several thousand miles away from family, I’d invite friends and neighbors to my house for an evening of RR recipes. This would happen monthly. #3 on my next visit ‘home’ (Scotland), I’d take home some recipes and cook and share the joy with my family and friends. This would happen once every 18 months. I would give Vegan on the Cheap to a friend (since I already have it and KNOW that it’s a great book), and keep the other two. Of course, Party Vegan would give me a great excuse to throw more parties and possibly convince a few of my omnivore friends that being vegan isn’t all about salad!! I would pass 1000 Vegan Recipes on to my Sweetheart’s brother. He’s always very open and eager to try vegan food and always careful and happy to make vegan food for me if I just give him the recipe. I’d mark my favorites in that one (Like the California Pasta Salad) and give it to him. I would use and read them everyday and try all the great recipes in these 3 fantastic vegan cookbooks. 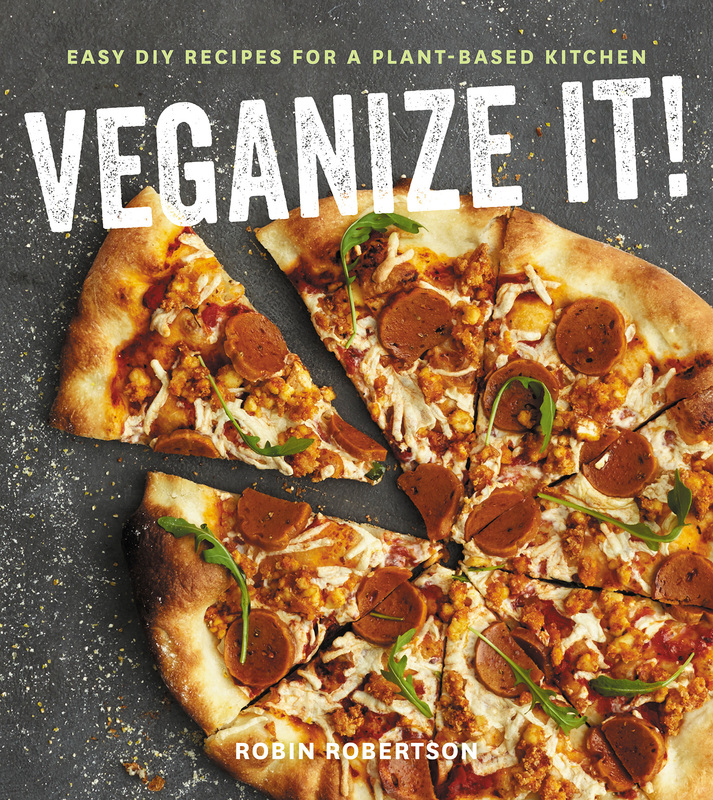 I would be inspired to make all kinds of dishes to share with others and spread the word about how delicious the vegan diet is and Robin’s cookbooks are the best. If I won these books I would give 1,000 Vegan Recipes and Vegan on the Cheap to my friend as a Christmas gift as I already own them. Party Vegan would be for me so I could make some fabulous Vegan food for my next party. If I won these I would give 1000 Recipes to my best friend since I already own it. I would plan budget friendly meals with On the Cheap and throw a party with Party Vegan. 🙂 Good luck everyone! I would share the 3 books with my son. Then we could read through each of them and try out and share different recipes. I would give the party book to my brother and SIL. They have tons of parties and are always looking for new things to make. The vegan on the cheap I would keep, and I would probably be greedy and keep the 1000 recipe one too. Maybe I would give that one to my mom if I was feeling extra generous. I would probably make a lot of the recipes and review the cookbooks on my You Tube channel. Though, Vegan on the Cheap would be especially useful to me, as I’m in AmeriCorps and only get a tiny stipend to live off of. I don’t have any of them yet, but I really hope to win so I can give “1,000 vegan recipes” to my only vegan friend, who is always having a hard time cooking at home with her parents around and struggles to find satisfying recipes! Wow. What a great giveaway! If I won these cookbooks I would give Party Vegan to my friend Cat who is an excellent hostess and always looking to put more vegan foods on the buffet. Surprisingly I do not have the other two, so I think I’d keep them. I would get out of my rut and try new dishes. These sound great! I would hold a VEGAN COOKING PARTAAAY!!! I already own the other 2 cookbooks but if I won Party Vegan, I would set up date to entertain and let my meat eater friends find out how delicious vegan food can be.. I would give 1000 Vegan Recipes to the library I work for – we only have vegetarian cookbooks at present and I want that to change! The others I would have to keep, since I don’t have them and I love your books! I would make and share many meals from them though. I just recently became Vegan from Vegetarian and I only know one other person who is one (in Switzerland) so I’ll probably keep all of the books if I win. By the way, your Cincinnati Chili recipe from The Vegetarian Chili Cookbook is fantastic! I make it time and time again. My mom is finally starting to embrace vegan eating and told my dad she’s not buying anymore meat. At least one if these books would go her way! I run a medically based cat rescue. We take in cats with extreme medical cases that will be killed at the shelter. We rehabilitate them and adopt them out. I have many volunteers who are not vegetarian and it shocks me that you can care so much for one species and eat another. I have been trying to convert my volunteers to a vegan lifestyle by sharing my stories, secrets and successes. Every year I throw an annual Christmas party in our home and it’s a NO MEAT affair. I saw your Party Vegan book and that would be just the ticket to prepare a glorious party menu to show my volunteers that you can be vegan and still have all the flavor, fun and party food you want. I would cook as many dishes I could and give them away to show that we know how to spice life up with good healthy yummy food! I don’t have any of the cookbook, so I’ll keep 2 for me and give the other one to my husband. That way, he’ll have no excuse to cook a good vegan meal once in a while. I’d share with one of my fabulous vegan friends! I would give a copy of each book to a dear friend of mine who has been vegan for a year and likes cooking now! I would give 1,000 Vegan Recipes to my Mom, as she has shown a recent interest in changing her diet and veganism. With 1,000 Vegan Recipes she will always have something to make! Vegan on the Cheap and Party Vegan would have to stay with me, however I would share the food with friends, family, and colleagues and change some minds about what vegan food tastes like (we all now its yummy, but I want everyone else to know too!). I would give one to a friend with a dairy allergy who used to enjoy cooking but hasn’t been able to get back in the habit in recent years. These would make a great wedding gift for my brother and future SIL! I’d give Vegan on the Cheap to the first aspiring vegan or new vegan I meet. It’s such a practical and fanstastic cookbook. I would give the one I have away to a friend who recently became a vegan. So many people ask me about how I eat and why, but don’t really want an answer. He truly wanted to hear my thoughts and was changed by asking himself the same questions. The other two books I would share with my daughters. One is a vegan and still lives at home, the other is a vegetarian who is on her own. She does many vegan recipes, so I think the book on affordable food would be a good bet. In all the traditions of cooking vegan foods begin in the home, but spread outward slowly like ripples in a pond. It is very satisfying to cook amazing food and have people who thought we eat nothing but carrots and seeds have an aha moment when they learn it is delicious! Thanks for all you to to that end! I want to win these 3 books for my family. We watched “Forks over Knives” and my husband suggested that we try to eat better without animal-based and processed foods which I agreed so we are looking for recipes and feel that these 3 books will be a TREMENDOUS help. I’d use Party Vegan to plan Christmas Dinner, Vegan on the Cheap for everyday use, and I’d give 1,000 Vegan Recipes to my friend who I’m trying to turn veg! I have two daughters, so I would let them each pick the one they want and I would keep the other one. I love your recipes and would be delighted to share the books. Thank you for the opportunity!! I’d give 1,000 Vegan Recipes and Vegan on the Cheap to my niece, Abigail, who is trying to eat well on very little money in grad school. She’s not vegetarian or vegan, but she’s very curious when I tell her I’m making pumpkin bisque, home made vegetable stock, or lentil salad. She’s a curious one, and I’d love to *feed* that curiosity! I admit I’d have to keep the Party Vegan for myself. I’d be looking for something tasty and fun to take to office parties, so my colleagues might one day embrace the food of their *weird vegan* co-worker. Thanks, Robin, for stirring up the fun! I’m a happy owners of 2 of your other cookbooks but not these! I will be giving away the cooked meals but not the books! Thanks so much – I love your recipes! I would give two books to my Mother-in-law as she always claims to be a “huge carnivore”, yet she is always curious about what vegans eat. The other I would donate to a local women’s shelter so they can use the book and see how beneficial cooking vegan is for their health, their children, and our environment! My daughter is going through chemo right now , so I would give her 1,000 Vegan Recipes to help her feel better and send her on a healthier road to recovery. I have Vegan on the cheap so I would most likely give that one to my parents but I will be greedy and keep the other two for my self, well maybe not that greedy, I cook a family meal 4 to 5 times a week so my parent are here for them so in a way they would still be getting them. I have 1000 Vegan Recipes and Vegan on the Cheap so I’d give them to my newly vegetarian niece and keep Party Vegan! I would cook amazing food for my family! My stepfather has MS and my mother has diabetes. They are both pleasantly surprised when I make dinner and, not only does it taste amazing, it’s vegan! Vegan was a scary word for both of them but not anymore. Both are losing weight, my mother’s numbers are coming down, and my stepfather was explaining veganism to an inlaw this Thanksgiving holiday! I would love to win so I have even more tasty recipes. I don’t have any of these books yet–my library doesn’t carry your books for some odd reason, and it totally bums me out!–and I would love to win them! I would like to keep them all for myself, lol, but I would probably give my sister Party Vegan as she loves to entertain and does such a wonderful job with everything…I am sure she would love having that book. What a fabulous giveaway–thank you! I would give 1,000 vegan recipes to my friend of over 50 years, Fred Lurie. We have known each other since we were 5 years old. We also adopted the plant based diet together on Oct. 1, 2010. Theater two books I will keep for Nancy & I .
I love to cook.. and I’m new to the vegan movement.. would love to learn how to make delicious meals!.. would definitely share these recipes with my friends.. maybe convert a few.. I don’t have any of your cookbooks, but I just checked out Quick-Fix Vegan from the library, and the recipes look amazing. I’m vegetarian but not vegan, and my daughter is totally vegan, so if I were to win the books I think I would keep one and give two to my daughter. Initially, I would keep all three of them to use as inspiration for a vegan cookbook I am in the process of writing. Then, I would give them away to my sisters as Christmas presents. Thanks! I would keep 1,000 vegan recipes because I do not own it yet. The other 2 I would give to friends at work who have expressed an interest in my eating habits! I have Party Vegan, so I’d give that to my friend who hosted Thanksgiving at her house. I’d want to keep the other books, but I would offer to share them with my new vegan friends or donate them to Houston’s Vegan Society of Peace for their door prizes at events. I already own the first two cookbooks 🙂 If I won Party Vegan, I admit that I would keep it. If I won the other two books, I would either give one or both to a friend who is very curious about vegan cooking, or if that fails, I would donate them to our local library. Hopefully they would add them to their collection! I would give the book of her choice to my daughter who is considering a vegan lifestyle. I’d keep the first one as it’s one of the few cookbooks of yours I don’t have. The other two I already own and use all the time! I’d give those two to my sister and brother-in-law who are nearly vegan these days. They’ve been working on improving their health and know they’d love your recipes. I would love to WIN these books. I am new to cooking and my wife does not do american food good. This would help both of use eating vegan . I would give one book to a co -worker only after reading the entire book for cover to cover. I would have to keep Vegan on the Cheap and Party Vegan for myself 🙂 I love to entertain so Party Vegan would be great, and I have 2 girls and would love some new ideas for lunches, etc. for them so Vegan on the Cheap would be perfect… Then I would feel guilty for keeping 2, so I would give 1000 Vegan Recipes to my friend, Lori, because she is trying to eat more veg meals! Thanks!! I would also be thrilled to win these books. I’d selfishly keep all of them because I need help getting out of my culinary rut and of course then I could “donate” good food to family, friends and co-workers and properly dispel the myth that veganism is a secret cult dedicated to lettuce and cardboard. Thanks! I definitely love all three of them, but would probably give ‘Vegan on the Cheap’ to my sister, so that she can try recipes that are quick and easy for her very busy family with two young children 🙂 But I’d make sure to ‘test’ some of them out before I give it to her LOL! What who I do if I was lucky enough to win these three books? 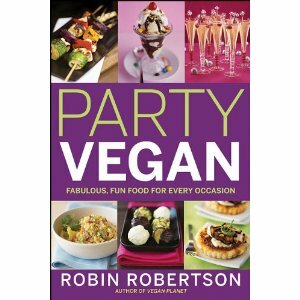 I would give the copy of Party Vegan to my SIL who, whilst not vegan, loves to cook and bake. I can even imagine the look of glee on her face at receiving it. 1,000 Vegan Recipes and Vegan on the Cheap are two books I should already own but always end up buying books for others instead. So, I would add them to my Robin Robertson collection and rejoice in having so very many more of your tasty (and ecomonically sound) recipes to choose from. If I won, I would keep Party Vegan for myself (so I can impress all the non-vegans in my life!) and give the other two away as gifts to people who have started to express an interest in veganism!! I own only 3 vegan cookbooks, one of which is Vegan on the Cheap, so I would keep the others and give VOTC to a friend who just contacted me for advice because her husband’s is trying to treat a medical condition with a vegan diet and he’s been struggling with the transition. Oooh; two of these are on my Christmas wish list. The third one I already have, but my son-in-law wants IT for Christmas, so I’d have a ready recipient for it! When I win ( yes I am confident), I would give the Vegan on the Cheap to a friend that has blood pressure issues and several other issues. The other 2 I would keep as I am new to this (only 8 weeks now) and I have testimonies of how the change in eating is literally saving my life (medical test to back up that statement). I am looking for new ways of preparing foods and working with a hectic schedule. Awesome! I usually try new vegan dishes for holiday meals, but the extended family is scared of them. I’d love to make something they actually enjoyed! I would give Vegan on the Cheap to one of my nieces, who is vegetarian, and Party Vegan to my bestie as she is interested in learning veggie recipes and has family for dinner often. I would keep 1000 Vegan Recipes as I have been wanting it for awhile now! Well, since I don’t have any of these books yet, I’m afraid I would have to be totally selfish and keep them all for myself. I’m a nursing student and my husband works a city job, so Vegan on the Cheap would be first up! I’d use Party Vegan to make something yummy to try and convince my fellow students at our Christmas party, and I’m sure I could find one or two of the 1,000 recipes to try out between now and forever! Thanks so much for this opportunity! I have Quick Fix Vegan and we use it all the time – my husband LOVES Snowballs in Hell!! I don’t have any of these books, so would be tempted to keep them all. But I would offer to m sister that she could first chose the book that she wanted, Then we could have fun trying out some of the recipes. I have been vegetarian for 23 years and would like to go vegan, so I would keep them for myself Just bought Fresh From the Vegan Slow Cooker, so I’m on my way ! I would love to have all three of which I do not have. But I would give one to my mom who is fighting cancer and I’ve been sharing my vegan recipes to her in hopes she will eat better as she goes through chemo. If I were to win these cookbooks, I would give Vegan on The Cheap to my friend from work as she is always looking for economical recipes that are vegan. The other two I would use as outreach tools in our Vegan Meetup group and they would be available for lending out to people who are curious about veganism or new to veganism. I shared the link via facebook for the contest. Hi Robin, I would LOVE to have copies of your cookbooks. My husband & I just “went vegan” 4 months ago after years of being vegetarians. I would love to start my vegan cookbook library with your books. I really enjoy your blog, Robin! If I won, I would keep Party Vegan. I already have the other two, so I would give them to my friend who is trying to go vegan, and doesn’t have a lot of money for cookbooks! If I won these books I would give them to my husband for Christmas. He has already asked for Fresh From The Vegan Slow Cooker. 😉 That way I get to give him what he wants for Christmas and I get the side benefit of enjoying all the yummy food! I would give Party Vegan to my mother. Our family doesn’t have a lot of gatherings, but my mother is always great about making vegan foods that everyone in our family will enjoy. I think Party Vegan would provide her with some new ideas for family meals, especially around the holidays! I would keep party vegan because I hope to have a vegan party one day! I would pay it forward and give one away, maybe even 2 :). I love love love my vegan collection of cookbooks. If I were to win one of these cookbooks. (I don’t own any), I would give Vegan on the Cheap away to my very good friend Becky who is learning how to cook, and I think the 1000 recipes would really be daunting for her, but VOTC would really help her out. I’d give Party Vegan to my other friend who really likes entertaining. I have four grown daughters, none of which are vegan. Robin, thank you so much for this generous gift to one of us (and many of us)! 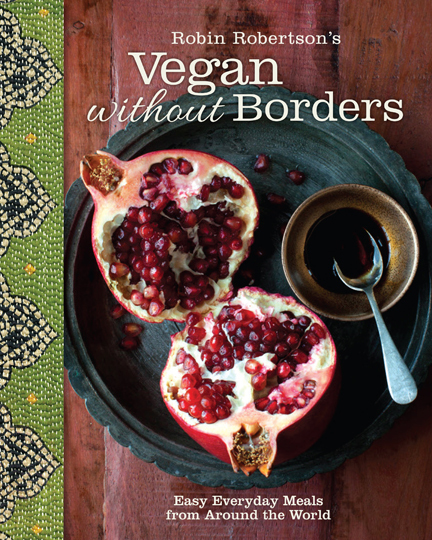 My birthday is on Saturday, and one of my birthday wishes is actually to get a vegan cookbook! I have been running low on ideas and inspiration lately and really want to make sure I’m eating well. Going on my third year vegan and would also love to share with my friends. I have two good friends who cook all the time (one professionally) and I would love to share one or more of the books with them so that this can spread. Blessings! I have Party Vegan so I would give that to my friend Nancy who is a foodie and loves the challenge of cooking a vegan meal for me. She has made a vegan Thanksgiving at her house for the past 2 years (or as she calls it…Thanksvegan) and is a gourmet cook. She would appreciate it. I would keep the other 2 for myself but probably share them with her as we share vegan cookbooks and once in a while have the pleasure of cooking together. I would LOVE to have these wonderful aids. I am new to vegan-ism and need all the help I can get. I would share them with my friends and they would want to buy. I would give my daughter these lovely books. She fully embraced the vegan lifestyle in March and is always looking for delicious recipes to expand her repertoire. Our granddaughter got married at the end of August 2012. We learned that night that we would be great grandparents in March of next year. The food was great at Ciao Baby’s Restaurant, but it certainly wasn’t a healthy meal. Our granddaughter and husband like to cook and eat and are “not close to their correct weight.” If my wife and I win, we will offer the cookbook to them, hoping they will make some changes in their diet. Honestly, I have been cooking since I was 10 and doing it fairly well. I became vegan 3 months ago and have subjected my family to 3 months of awful meals. If I won these 3 books I would keep them and continue trying to learn how to make nice meals that don’t require abusing animals or the environment. If I were to win I would love to give Vegan on the Cheap to an elderly couple I am friends with. They have spent their lives helping animals and currently have 48 rescued dogs and 11 rescued cats living with them. They have run into hard times and concentrate on spending money on food for their loved pets and not on themselves. Maybe this would help them to prepare meals that are affordable for them. I would LOVE these cookbooks! I always browse through 1000 recipes when I’m at the bookstore! I really want to start blogging about good vegan eats and these would be an amazing resource. I would share them with both of my family. Here’s why. My sister and I both live within an hour of our parents who have medical issues: our mother is diabetic with congestive heart failure and high blood pressure. She is unable to walk and has a live-in home health aid who is willing to try any recipe we give her to improve my mother’s help. It was recently discovered that our dad has an enflamed thyroid and lymph nodes and is slowly changing his SAD diet to a vegan diet. My sister and I both take turns making entrees to take to them that the home health aid can reheat and serve them. We are trying to get them healthy and help them to feel better. I would share them with both of my family. Here’s why. My sister and I both live within an hour of our parents who have medical issues: our mother is diabetic with congestive heart failure and high blood pressure. She is unable to walk and has a live-in home health aid who is willing to try any recipe we give her to improve my mother’s health. It was recently discovered that our dad has an enflamed thyroid and lymph nodes and is slowly changing his SAD diet to a vegan diet. My sister and I both take turns making entrees to take to them that the home health aid can reheat and serve them. We are trying to get them healthy and help them to feel better. I would love to win the party book. I love to entertain and feel that cooking for a large group is always a challenge. I love your other cook books and I use them all of the time. Did not buy a power ball ticket may-be I can win your wonderful books…I think that is equal to 50 million dollars don’t you? I’d give one to my mom, one to my sister and one for myself!! My mom is really trying to eat a more plant based diet and in February she has agreed to go completely veg for the month! I have also tweeted!! Thank you so much for all of your generous giveaways!! I would give a cookbook to three of our many metro Denver/Boulder nonprofits that serve the food-insecure, the homeless in transitional housing, and the rehabilitation communities, so they can see that a plant-based diet is healthy as well as budget-friendly. The three I would choose are the Food Bank of the Rockies, the Dolores Project, and Cooking Matters Colorado. I would give at least one of these cookbooks to my sister. I have been vegeterian for a while, but recently she decided to go vegetarian for health and weight reasons, and now has ethical reasons. It has been fun sharing tips and recipes. I already own 1000 vegan recipes, so I would give it to one of my friends who is trying to eat more vegan food. Well, I would probably have to keep Vegan on the Cheap. 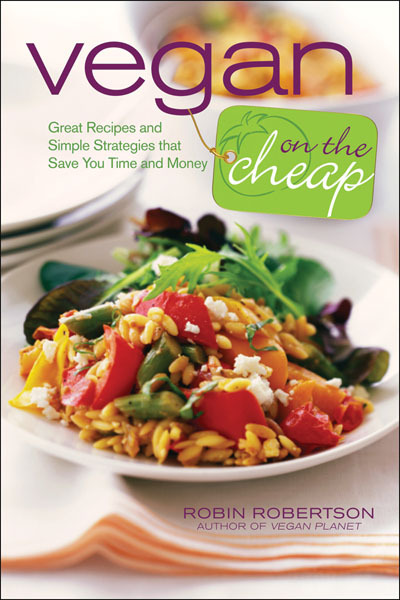 I keep renewing it from the library- lots of recipes I really love! I would donate Party Vegan to the library and give 1000Vegan Recipes to a friend . I would jump up and down if I won- then I would cook like mad! Thanks so much for the chance to win! I would give the 1,000 vegan recipes to a friend who is vegetarian and her husband is vegan (after looking it over and copying the recipes that I want to try). She and her husband are new vegetarians/vegans so this would be an encouragement and keep the other two. the others, obviously i would keep. 🙂 and cook out of. I’ve been eyeing 1,000 Vegan Recipes for awhile, but what I’d do if I won, is use the Party Vegan book to plan and host an ‘ugly sweater’ party this holiday season. 😀 Having that book would make it much easier to plan an event like that. I have to say that I would likely keep them all to myself since I don’t have any of them! However, I do love our library, so I might also give one of them to the library so that others can enjoy it too! I already have Vegan on the Cheap so I’d give that to a veggie- or veggie-friendly friend who didn’t already have it. The others I’d keep for sure! I would give 1000 vegan recipes to my son, I already own that one and keep the other two for myself. Thanks! I would learn to cook better vegan recipes, which would help me make more and better vegan choices. I would share these with family and friends, helping them to better their own meals; and continue to build my nutritional knowledge and good health! I am a new vegan with only one cookbook. I would use, use, use these until they were worn out! My husband is going on this journey with me so I would be looking for recipes to appease the carnivore in him, also. Great giveaway. Thanks. If I won these 3 fab cookbooks, I would curl up on the sofa and begin reading and dreaming. I love looking at fabulous vegan recipes. Linked on FB so others have a chance to win! I would love to give these to my sister for Christmas! She would love them! Although…I might need to keep one for me! LOL! I would give “Vegan on the Cheap” to my oldest son, who is vegetarian but not yet vegan, as I already have a well-used copy, and cook from it regularly. (I am an older disabled person living on a fixed income. So this book is really a Godsend. I especially am thankful for the items in her basics chapter that replace expensive health food store items like her Tofeta, Faux Parm, Handy Hummus and her seitan recipes). 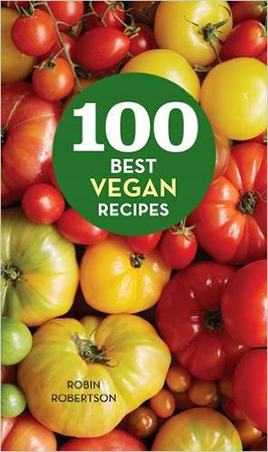 The 1001 Vegan Recipes I would use to replace a cookbook called 1001 Vegetarian Recipes that is not so useful, as I do not eat any diary products any more. The Party one I would cook Christmas and New Years spreads from, then consider giving it to my daughter who is not even vegetarian, but might well become vegan if she tasted the good food in Robin’s books. She already makes vegetarian and vegan food she grew up with. (I also cook from Fresh From the Vegetarian Slow Cooker” and dearly love it. I plan some time when I can afford it to get her new “Fresh From the Vegan Slow Cooker”. It surely must be wonderful because her older book is.) One thing I appreciate in Robin’s books is that all the recipes were obviously carefully tested as there are no duds at all. This is unusual in cookbooks, actually. Thank you, Robin! I would absolutely love these cookbooks! I would use them almost immediately! Thanks for the giveaway! I admit, I would keep Vegan on the Cheap since I don’t have it! I would gladly donate the other 2 cookbooks to our high school’s library. Awhile back there was an article published in our newspaper about the sad state the library was in, due to funding, and that the cookbook and food section was especially neglected, no books on healthy cooking or nutrition 🙁 I’m always glad to spread the vegan gospel 🙂 And I especially think that teenagers would love the ‘party vegan’ book! I’d give them to my sis- a vegan mother of vegans! I f I were to win these cookbooks I would probably give 1,000 vegan recipes to a friend of mine who is dating a vegan and loves to cook for his sweeties. As I find myself in greatly reduced financial circumstances I would keep Vegan on the Cheap and Party Vegan to liven up my potluck repitorire. 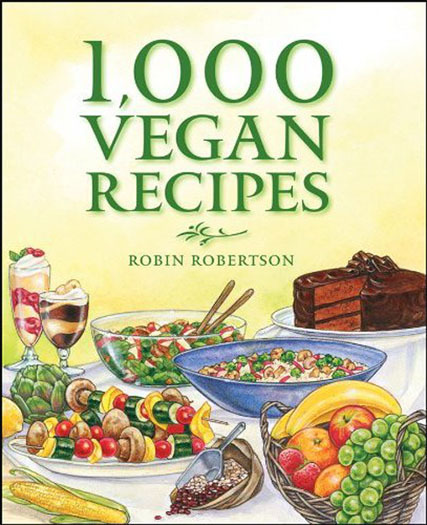 If I were lucky enough to win this delectable motherlode, I would gift the “1000 Vegan Recipes” cookbook to my new friend, Robin, who is considering the vegan lifestyle. I would send the “Vegan on the Cheap” cookbook to my son, Tyler, who lives on a tight budget in NYC, and finally, I would give the “Party Vegan” cookbook to my cousin, Rosa, who does a fair amount of entertaining. I just posted this great cookbook Giveaway on Facebook! I would definitely spend several weeks cooking from these books, and give myself a fun thing to blog about! I already have 1,000 Vegan Recipes and Vegan on the Cheap so I would give them to my wonderful daughter Jessica, who became a vegan last year after she read a book I gave her. She loves my vegan cooking and wants to learn how to cook vegan food. I would keep 1,000 Vegan Recipes if I won, as I have been wanting this one for awhile. Then I would attempt to find someone wanting to trade a copy of Vegan on the Cheap, which I currently own, for Vegan Fire and Spice, since this is the type of food I normally prepare and it would be nice to have a new take on it. With Party Vegan I would send it to my vegan friend living overseas, since it would be nice to get something for her for Christmas and reconnect by unexpected giving. I would share them with my mom and sister so we could all use them! I would be cooking through them this winter! I would try to find ones that my son could help with too, so he can get a good start on helping in the kitchen! I would give these to my daughters to help them with making good choices in their diet. Maybe I would keep one for myself. I would give Vegan on the cheap to my sister-in-law who was the first to tell me about it, she usually takes in out from the library. I would give 1000 vegan to my husband to help him with vegan dinners, and then I would keep the party vegan for me! I would give all three to my sister. I am on a mission to get her to eat healthy and these would certainly help! I would make my New Year’s Resolution to cook through 1,000 Vegan Recipes! I would love to win these three books! 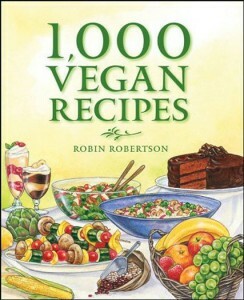 I already have some of Robin’s books (including Vegan On The Cheap) and love them all. I would give that one away as a gift and keep the other two for myself because I have always wanted them! I would give them to my daughter in law, who is interested in being vegan, but doesn’t know how to cook. These are great books- I own them all. I would love to give them as gifts and spread the word about delicious vegan food. I would give them to my cousin, who just became vegan! 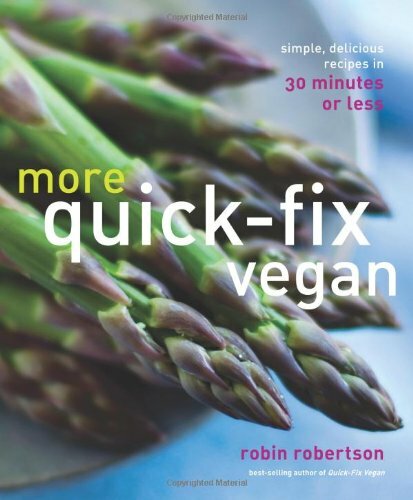 I have your quick fix vegan book and I just love it! I would love them all! I do have (and love) all three books, but I’d love copies to give to my dear friend Lenore, who has been vegan for over a year now and only has one vegan cookbook! She’s a pretty good improviser, but I had decided I’d like to give her some good vegan cookbooks for Christmas – it would be wonderful to have these three to wrap up for her. Oh, I’d definitely keep VOTC and 1,000 Recipes! I’d give my sister Party Vegan since I’m expecting that in the mail soon!! Then we can both make the same recipes–I buy her and my mom the same cookbooks I have so we can all do that. Henceforth, my mom would need an Xmas copy of PV! I love these three cookbooks so much! I’d absolutely give them to friends as gifts! love some! Sometimes I struggle when I don’t have anything made and I am starving! that it is the healthiest lifestyle. I would love to give Vegan on the Cheap to my son. He’s a vegetarian college student living in a house for the first time. He loves to cook, but definitely needs “on the cheap”! I would probably keep the others for myself 🙂 I am always looking for great new recipes! I would keep “1000 Vegan Recipes” for myself because it is one of your few books I do not own and I could eat 1000 of your dishes. I would give “Vegan on the Cheap” to my pennywise friend, Amy; she and I exchange cooking tips often. Lastly, I would give my Mama Party Vegan because she is THE ultimate hostess and would close her eyes with pleasure eating Collard and Red Bean Fritters! I already own Vegan on the Cheap, so I would give it to a coworker of mine who is trying to go vegan. I think it would help a lot! If I win these 3 vegan cookbooks I will dance on the sand in sunny AZ and then I’ll give them to my vegan friends because I have and LOVE “Party Vegan” and “Vegan on the Cheap” and I just won “1,000 Vegan Recipes”. My husband is an amazing cook – Except when it comes to vegan-style! We both prefer a whole-food, plant-strong diet but for some reason he just can’t think of anything to make – I am hoping to give him any or all of these books for Christmas so he can be inspired and I can have a night off from veggie wraps. I need to get him off the lazy “chips & salsa” diet before he goes back to eating meat! I can’t lie — I would totally want to keep Party Vegan for myself. I have two family members who would love these wrapped up with their Christmas gifts, and they would get the other two! Love your cookbooks, Robin! I have three of them, but Vegan on the Cheap is the only one of the giveaway group that I own. I would be so excited to win these so I could share them with my daughters!! One of them is a single mom who would love Vegan on the Cheap; the other entertains often, and would love the Party Vegan. Then I could keep the 1,000 Vegan Recipes for myself!! Thanks for making this offer, and even bigger thanks for the fabulous recipes. I would keep the Vegan on the Cheap and give the others to two different people. First, a friend who is vegetarian, but likes a lot of vegan food, the other a co-worker who is vegetarian but is always looking for food to prepare for get-togethers. what wonderful books to win! I’d give these books to my 11 year old daughter who just yesterday started her Vegan Experience for her 6th grade Science Fair. Her goal is to eliminate animal protein in her blood with the hopes that in 4 weeks, there will be a noticeable difference in lowering cholesterol and glucose levels as well. She’s gone to her doctor to get “before” blood tests and will document her meals, mood swings, cravings, compare her personal home-made Vegan school lunches to the USDA approved school lunches proving how unhealthy they are. She’ll follow up with blood tests “after” as well, and then share her Vegan Lifestyle Presentation. 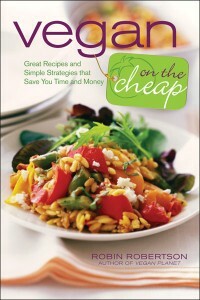 I already own Vegan on the Cheap — in fact, it’s one of my favorite cookbooks ever! That one I would give to my mom, because my favorite lady should have a copy of my favorite cookbook. My husband and I live apart from each other right now for grad school, so the other two I would divide between us. After a few months we could switch them, and that way we could talk about our favorites from them and look at each other’s recipe notes in the books. I would give the cookbooks to my wife to help her figure out what to make for our vegan daughters when they come home to visit. I’m afraid I would spend an inordinate amount of time reading all three and then compiling holiday menus and then cooking and baking. And I would love every minute. I would share with my coworker who shared your Vegan Slow-cooker cookbook with me! If I won any of these cookbooks, I would give them to family members so they would have an idea of things to cook for me when I come over : ) also, to maybe get them to add more vegan recipes into their own diet!!! Seeing as how i already own 1,000 vegan recipes i would most likely give that one to my parents as a christmas gift, since they have been more open to eating vegan food. 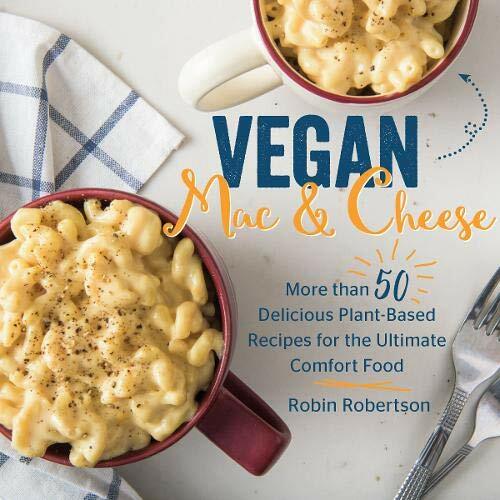 Even though they still consume meat and dairy on the daily i know this lovely cookbook would help the transition of them getting more veggies into their system. As for the other two books i would delve completely into, having as many vegan dinner parties as i can afford. And i would enjoy learning more and more of your fabulous recipes. Though I have two of your other titles, which I use constantly, I don’t own any of these…so I would keep them for myself! BUT I would invite family & friends over for delicious vegan festivities all the time, showing them the wonder of vegan cooking. I was successful in converting a good friend of mine and her father to veganism. Her father was suffering from all sorts of maledies and saw the reversal because of a vegetable based diet. My friend, Crystal, also was successful in the transformation. However, she has become pregnant and refuses to accept the fact that she can remain vegan and have a healthy pregnancy. I feel that one of these cookbooks can re-invigorate her veganism and change the way she feels about it. Thanks for the great blog and website. I would give one to my omni sister to show her that vegan food is accessible and delicious! 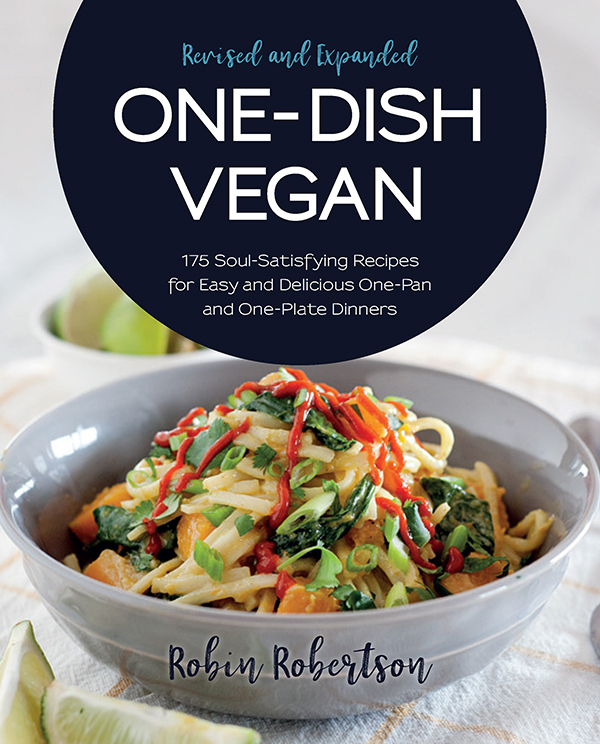 I would clear out space on my cookbook shelf right away for 1,000 Vegan Recipes as this title has been on my wishlist for several months; a free copy would be awesome! I would give Vegan on the Cheap (which I own and LOVE) to a friend who needs to lose a little weight and eat healthier, but is concerned that she can’t do it on her limited budget. As for Party Vegan, I would either keep it or give it to a friend or family member who does more entertaining than I do. I’d experiment with a few recipes before deciding whether to keep or gift. I also posted a link on Twitter. Hi Robin, if I won these books, first I would read them cover to cover, as I do every cookbook. To me they are novels. Then, I would give Vegan on the Cheap to my daughter because she lent me her copy and I never gave it back. Party Vegan would be used to plan my Christmas buffet and I would start working through all the recipes in 1000 Vegan Recipes. Thank you so much for this giveaway. I share this on my twitter feed. Your books help so many people become vegan. I lend them out to people all the time. These would be more books that I would lend out to people who wonder what vegans eat or need help getting started. If I won, I would give one of the books to my dear friend Jennifer who just turned me on to your website. I am so excited to learn new recipes and eating healthier for me and my family. Times have been challenging since I was laid off a few months ago, but I have faith things will work out. Thank you for sharing your culinary skills with everyone. Grateful! 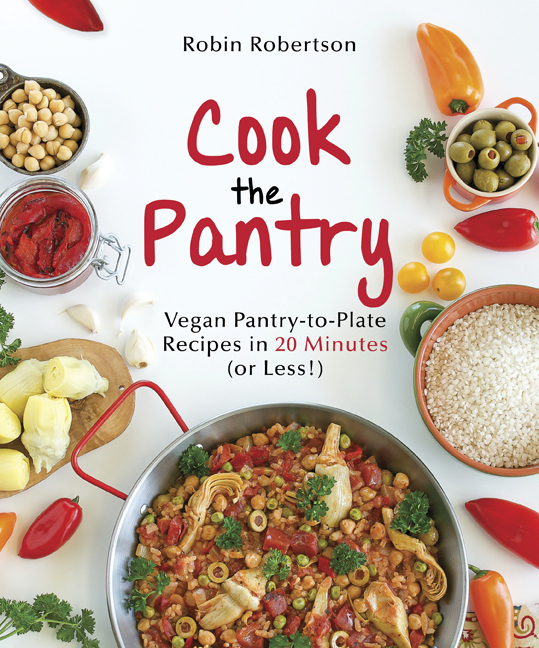 I would cook delicious vegan food from all three books and share it with my family and friends! 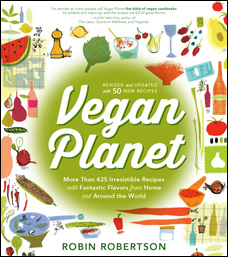 I would also share these books with my mom who is starting to cook vegan more often, and I love to encourage that. I would give the Vegan on the Cheap to my friend, Mark. He is just learning about eating this way and would love this cookbook! I would love to win your Vegan cookbooks. My son just announced that he is a Vegan and we’re looking for good ideas and your books are just the right place. I would give the books to my wife Yael who loves to get her ideas from printed material. Just indicating that I posted this contest on my blog! I would keep all 3 books for myself. Although I am not totally vegan I do love a lot of vegan recipes and would love to expand my recipes to try. I would keep them because I’m always looking for new recipes so that I can’t cook for other people! I love sharing my meals with non-vegans and showing them how tasty it is! I’d keep Party Vegan because I don’t own that cookbook. I’d gift the other 2 awesome cookbooks to my sister-in-law, as I already own those. Happy holidays to you & Jon! Thanks for the giveaway opportunities! I linked to your giveaway on twitter. I would like to share my love of vegan cooking with my husband and my parents. They all could use a little instruction on how to prepare healthier food! I would love to have all three of these books but in the spirit of giving thanks, I might be willing and able to donate one to our public library so that many could share. Nice blog and good to “meet” you. I’m a first timer here. I’d send them to a good friend of mine. I’d keep one and give the others as gifts. I would probably keep all the books, but I would make recipes from them for others. I would give them all away–because I already have (and love) them! OK I have to be honest. Though I have a couple of your books I do not have these. So I have to admit I would be greedy and keep them all. But I would sing the praises and recommend all the recipes that I make and share. I own “1000” and “Cheap” so I would give them to a friend who is interested in eating healthier and more compassionately. I would keep “Party” and … Hmm, maybe I’d host a vegan party and use some of the recipes!! I could always use more awesome recipes! All 3 of these books look awesome!! I have Vegan on the Cheap and love it. I would give that to one of my long time high schol friends, Joy, who has been inspired by my journey. She recently asked me what books have helped me and I mentioned some of the cookbooks I have including Vegan on the Cheap. Is the competition open to overseas entrants? I would give Vegan on the Cheap to my friend Belinda, who recently tried the 30 day vegan easy challenge and didn’t quite stick with it. She’s on a very low income, and didn’t have a good arsenal of recipes that don’t rely on expensive mock meats and gourmet ingredients. I would give 1000 Vegan Recipes to my friend Heather, who is always saying she is interested in veganism but doesn’t make the plunge. I think having such a treasure trove of recipes would help give her a push! And I would keep Party Vegan, so I can throw lots of vegan parties for my non-vegan friends and wow them with the wonders of vegan food! If I won these cookbooks, it would help me move forward and dedicate my health to eating vegan. I am 60 years old and my husband is 57. We have been married for 30 years. I have lead a healthy life and always “thought” I was eating healthy, exercising and living a healthy lifestyle. Unfortunately, I have several health issues that I have been seeing doctors, both MD’s and naturopathic. I recently was tested for bone density and now have osteoporosis along with arthritis, migraines and osteoarthritis. After watching Forks over Knives, I am determined to stick to a plant based diet and believe my body will heal itself. I am not going to take bone density medication and believe that if I eat a plant based diet and exercise, my body will rebuild my bones, my migraines will go away and I will get stronger and live a long and healthy life. However, I do need guidance and recipes to prepare for myself and my husband on our new path to health. Thanks for listening and I hope I am the winner of your cookbooks. I would give away “Party Vegan” on The Thinking Vegan since I don’t really enjoy being around people and wouldn’t want to be tempted to have a party so that I can make the recipes in the book. I think a vegan party would be in order! I don’t own any vegan cookbooks, so if I won, I would keep all three! I’d give Vegan on the Cheap to my friend who is just learning to cook vegan! Ive made so many great recipes from that book. Thanks for the chance! I would cook from Party Vegan for the first month, and lend the other two to my friends. Then, I would exchange Party Vegan for Vegan on the Cheap and cook from it. In the end I would cook from 1000 Vegan Recipes. I would continue my journey of becoming Vegan and healthy as well as use the books as a guide to help incorporate my family in the journey. I’d give them to my newly vegan sweetie. He would love it. I would definitely give at least ONE to my brother, whose daughter, now 5, has a brain tumor (which I firmly believe is exacerbated by eating meat and dairy). I would fly out to TN just to give the books to them, after cooking them a meal from the book. I would smile REAL REAL big! I would be in the kitchen trying new recipes, cooking and baking, chopping and pureeing. I might share the books but then again I might just share what I create using them. Next post: Three Cookbook Giveaway Winner! Previous post: Post-Thanksgiving Pizza + 1,000 Vegan Recipes Winner!